Since appearing on Gordon Ramsay’s television programme and winning best Thai restaurant, Nahm-Jims has become incredibly popular. But reviews (e.g. on tripadvisor) have been very mixed with particular complaints about the poor quality service and rather bland food. I went with a party of 9, with some trepidation after reading the reviews. Fortunately, we had a great experience – the service was friendly and efficient and the food was very enjoyable. I don’t eat Thai food often and don’t know it at all well but I did see the TV programme where Nahm-Jim’s was featured so I had to try the Thai style Haggis. Essentially, it was haggis with a hefty hint of chilli – I thought it worked well although I guess it isn’t available in Bangok. 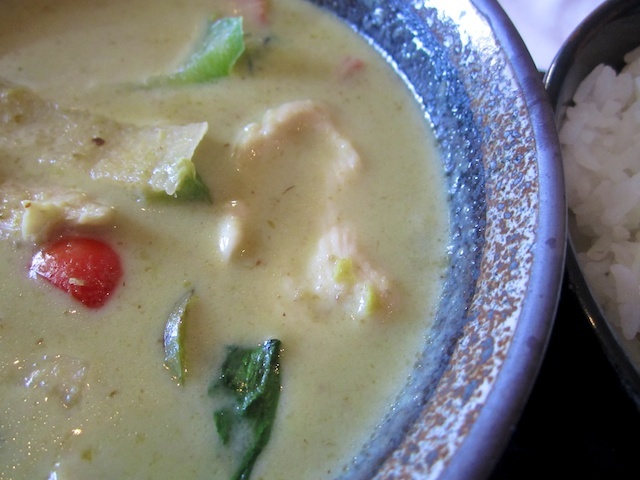 Given the reviews, I decided to play it safe for my main course and ordered Thai green chicken curry. I haven’t eaten this much but it is fair to say this was the best I’ve had. Subtle spicing and not too much chilli. The coconut rice was hyped so I tried it – not worth it – steamed rice would have been better I think. Other dishes looked equally good and everyone enjoyed their food – I’d be delighted to go back – and will be more adventurous next time. Not cheap – but Thai food never is – about £35 eincluding some drinks but not a lot. 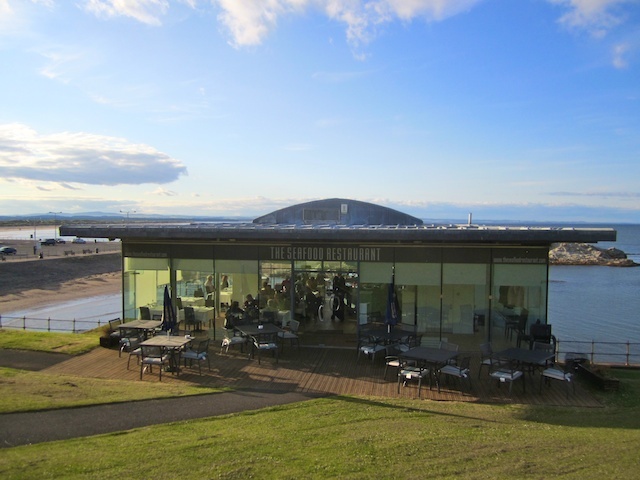 The Seafood restaurant in in a wonderful setting on the cliffs in St Andrews, overlooking the sea. It specializes, as the name suggests, in high quality seafood and I took some visitors there for dinner. After an initial glitch when we had to change our booking time and the lady on the phone was rather negative, the staff and service were great. Nothing was too much trouble and, in spite of the dire predictions of long waits for food because we were late, the timing was, in my view, perfect – not too fast and not too slow. I started with Moules Mariniere – a favourite of mine and it was perfect. Lovely plump mussels, all bright orange and flavourful sauce. My main course was North Sea Coley (I am trying to eat sustainable fish) with risotto which was almost right. 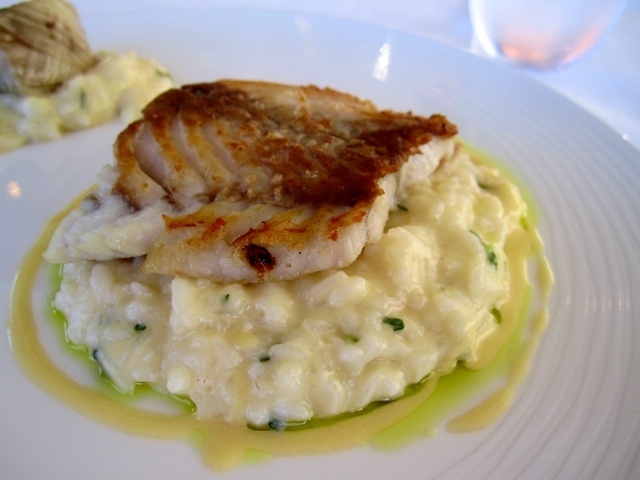 The risotto was creamy and delicious and the fish was obviously fresh and high quality. But it was over-salted, which spoiled it a little. My dessert was disappointing – raspberry panacotta. 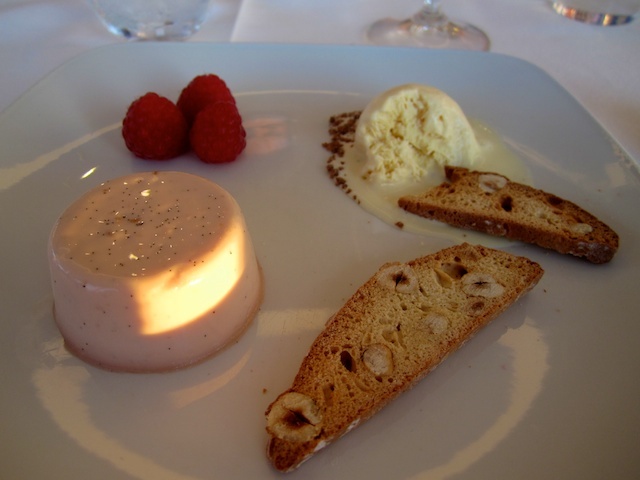 I find it really hard to get panna cotta right – it always turns out too rubbery and I suppose it was good to know that professionals have the same problem. It really was too thick and, I thought, lacked depth of flavour. We were bout £50 each, which included some vey nice New Zealand Sauvignon Blanc. So, the Seafood Restaurant has almost got it right – it just needs a little bit of attention to detail. 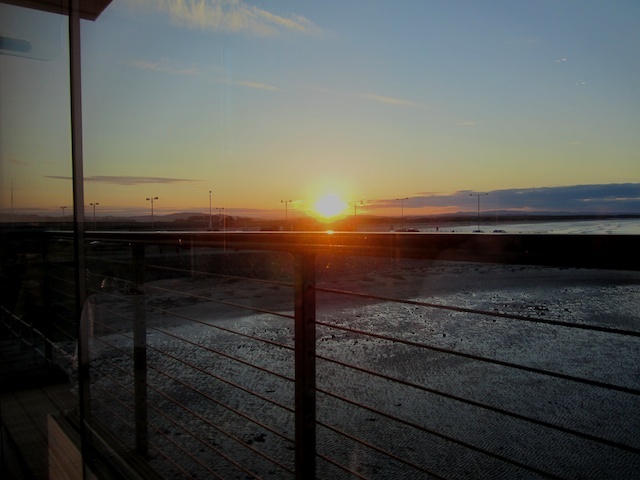 But the view of the sunset over the links is so nice.